Posters from Society for the Neurobiology of Language, Chicago, IL, October 15-17, 2015. Haskins Laboratories has launched a new collaboration in its efforts to improve language and literacy outcomes for children at risk for reading difficulties worldwide. Haskins has partnered with the AIM Academy, a grade 1-12 school for children with language-based learning disabilities, and the AIM Institute for Learning & Research. 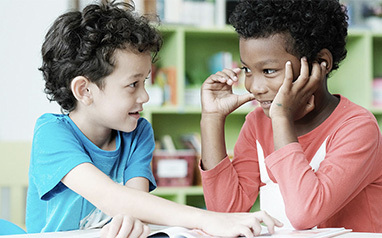 Through the collaboration with AIM, Haskins will work with educational researchers, service providers, and academic leaders to translate the growing body of research in the science of reading and language into early identification of and best practices in treating language-based reading problems. The collaboration is part of the Haskins Global L2(Language & Literacy) Innovation Hub. An international and interdisciplinary initiative, the hub brings together researchers, practitioners, educators, and education technology specialists to: improve the sensitivity of early language assessment and intervention; deliver on the promise of neuroscience-guided reading instruction and remediation; scale the solutions to global challenges using education technology; and train a new generation of educators and clinicians. Read more about this innovative partnership in the Yale news.